DaVinci Resolve has made its mark as one of the premier color correction applications for the film and video industries. With the introduction of Resolve 14*, it’s clear that Blackmagic Design has set its sights higher. 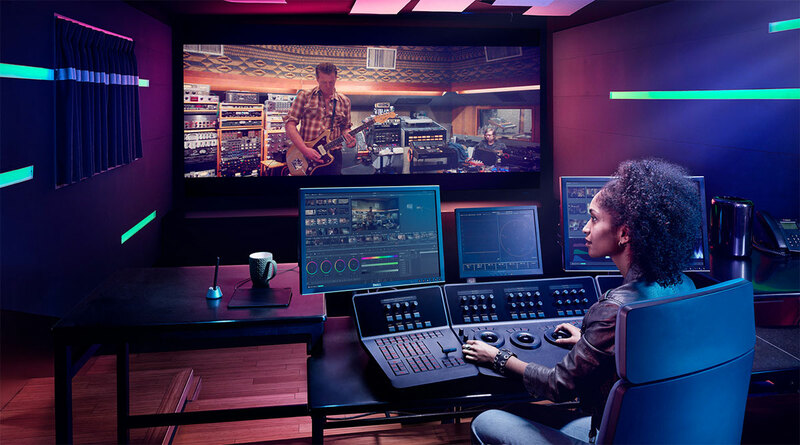 Advanced editing functions and the inclusion of the Fairlight audio engine put Resolve on track to be the industry’s latest all-in-one post-production powerhouse. I’ve reviewed Resolve in the past as a grading application, but my focus here is editing. Right at the start, let me paraphrase the judges on History Channel’s Forged in Fire series – ‘This NLE can cut!’ If you have no prior allegiances to other editing platforms, then using Resolve as your NLE of choice is a no-brainer. DaVinci Resolve 14 comes in two flavors, DaVinci Resolve 14 (free) and DaVinci Resolve Studio ($299). Upgrades have been free to date. It’s the only NLE to support three operating systems: macOS, Windows, and Linux. Mac users also have the option to download Resolve (free) or purchase Resolve Studio through the Apple Mac App Store. These versions are basically the same as those on Blackmagic Design’s website, but with some differences, due to the requirement that App Store software be sandboxed. 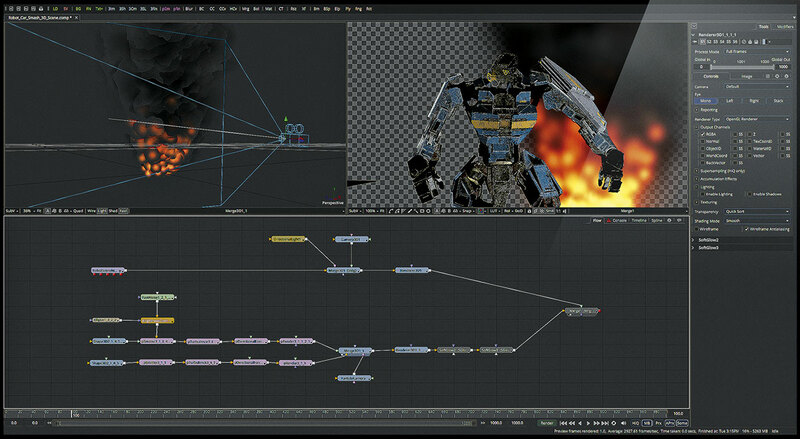 Resolve offers the majority of the same features as Resolve Studio. The primary limitations are that exports are capped at UltraHD (3840×2160), and that features such as stereo3D, lens distortion correction, noise reduction, and collaboration require Resolve Studio. Regardless of the version, Resolve is a very deep application that’s been battle-tested through years of high-pressure, enterprise-grade deployment. But is that enough to sway loyal Final Cut Pro X, Premiere Pro, or Media Composer editors to switch? There’s certainly interest, as Stephen Mirrione pointed out in my recent Suburbicon interview, so I wouldn’t be surprised to hear news of a TV show or small feature film being edited with Resolve in the coming year. Creating a single application that’s good at many different tasks can be daunting and more often than not has been unsuccessful. In the case of Resolve, Blackmagic Design has taken a modal approach by splitting the interface into five pages: Media (ingest/import), Edit, Color, Fairlight (audio mixing), and Deliver (export/output). The workflow follows a logical, left-to-right path through these five stages of post-production. With each page/mode change, the user interface is reconfigured to best suit the task at hand. 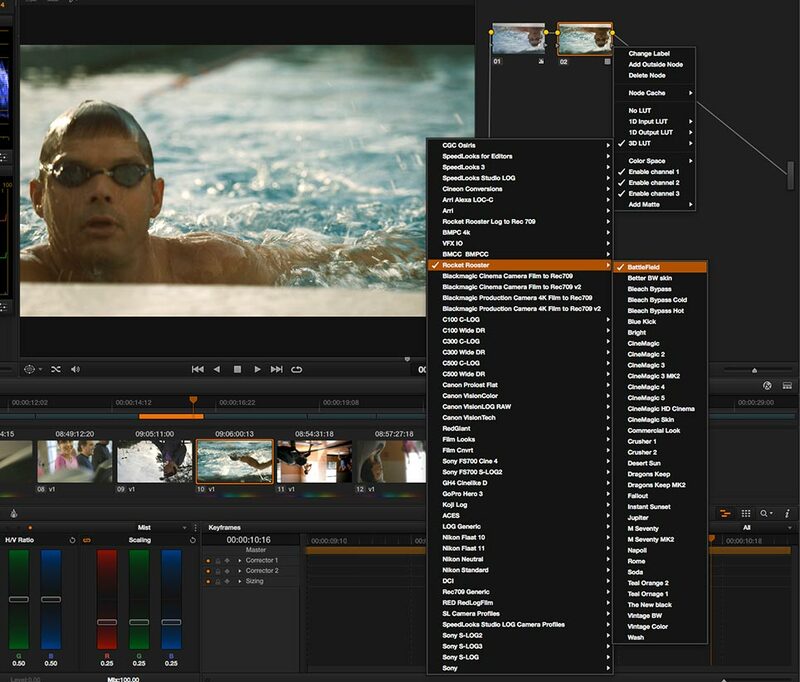 The Edit page sports a standard source/record/bin/track layout similar to Media Composer, Premiere Pro, or Final Cut Pro 7. 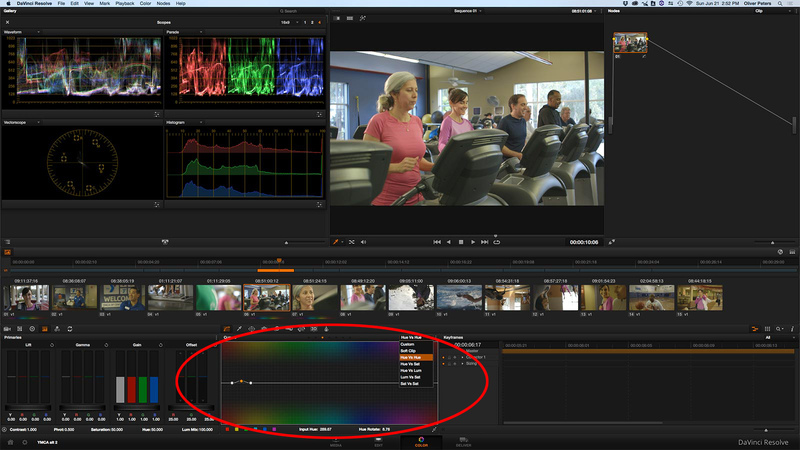 Color switches to the familiar tools and nodes of DaVinci color correction. The Fairlight mixing page isn’t just a mimic of the Fairlight interface. The engineers completely swapped out the audio guts of Resolve and replaced it with the Fairlight audio engine. Not only is the interface that of a respected DAW, but it is also possible to expand your system with Fairlight’s audio acceleration card, as well as add a Fairlight mixing desk. This means that in a multi-suite facility, you can have task-specific rooms optimized for editing, color grading, or audio mixing – all using the exact same software application without the need for roundtrips or other list translations. I put both versions of Resolve 14 through the paces and the application is reasonably solid, given how much has changed from version 12 (there was no version 13). General media management, editing, and audio processing is top notch. If you want audio/video output, Blackmagic Design Decklink or UltraStudio hardware is required. There is also a Cinema viewer function for fullscreen viewing on your computer display. With dual displays, the edit interface can be on one along with fullscreen video on the other. The Fairlight mode will likely require a bit of rethinking by editors used to mixing audio in other NLEs, since it uses a DAW-style interface. Many well-known physical mixing consoles, like those from Solid State Logic, feature channel strips with built-in EQs, compressors, etc. That’s how Fairlight treats these software channels or tracks. Each track can have its own combination of Fairlight audio processing functions. Stick with those and you’ll be happy, although other audio filters on your computer, like Apple AU plug-ins, are accessible. Mixing and audio editing is good with subframe accuracy and the 14.1 update added linked groups to lock faders together. The pace of Fairlight integration was quite fast, but it’s still a bit rough. I encountered a number of application crashes only in the Fairlight page, while scrubbing audio. Whether or not you like the editing is more a function of personal style and preference. The user interface design is a lot like Final Cut Pro X, except with bins and tracks. Interface windows, tabs, and panels can be opened or pulled down into various screen configurations, but you don’t have freeform control over size and position. Clearly Premiere Pro is king in that department. Some design choices aren’t consistent. For example, you can’t enable a single-viewer layout when using two displays. Multicam editing is solid, but I experienced a small bit of latency in the viewer when cutting camera angles on-the-fly. It’s minor and may or may not bother you. You can sync clips by various methods, such as timecode or waveform, but oddly, it seemed to be too lax. In my tests, it would frequently sync clips that it shouldn’t have when a sync relationship didn’t exist. There are a number of things in Resolve’s design that take getting used to. For example, a Resolve project is locked to the frame rate you picked when that new project was created – same as with Avid. This means you can’t mix sequences with different frame rates within the same project. There are no adjustment layers, although you can fake it in the Color page by using clip and program-based corrections. Color management via LUTs (look-up tables) is much deeper than any other NLE. You can set color management with LUTs to be global, which is best when the project uses only one camera type. Conversely, input LUTs may be applied singly or in a batch to specific cameras in a bin. But, when you do that, the LUT process doesn’t show up in the color correction node (only its result), when you switch to the Color page. On the plus side, real time performance has been improved from previous versions and the built-in effects include filters that you don’t often find in the basic build of other NLEs, like glow and watercolor effects. In addition to great built-in effects, third-party OpenFX packages, like Boris Continuum Complete and Sapphire are also available. 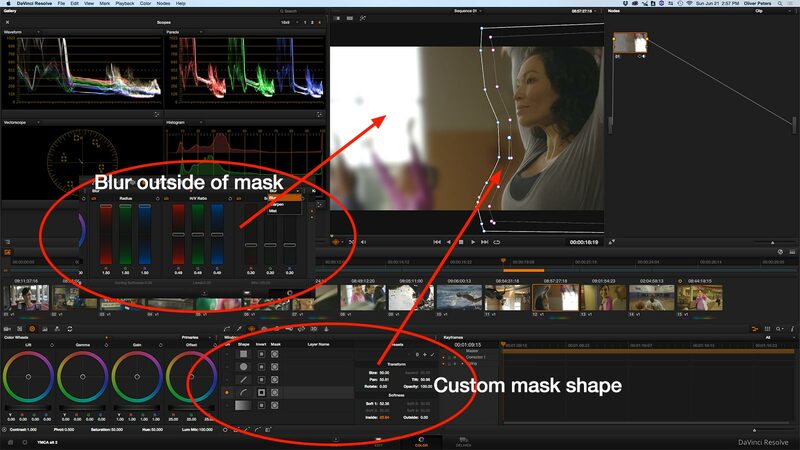 Resolve uses bin-locking like Avid Media Composer. The first editor to open a bin has read/write permission to it. Any other editor can open that same bin in a read-only mode. For example, in a long-form project, separate bins might be organized for Act 1, Act 2, and so on. Different editors can separately work on parts of the film at the same time. Since this all happens in a single database file, it always reflects the most current state of the project. To set up shared projects, a different PostgreSQL database is required, which is installed through the custom options of the installer. Make sure you are using the most recent version when upgrading Resolve, since the older versions of PostgreSQL are no longer compatible with the newest OS versions. One machine on the network hosts this database and then other workstations connect to that database to access the Resolve projects. Only that host machine needs to have PostgreSQL software installed on it. The process of adding and connecting shared databases has been improved and simplified with the release of 14.1.1 (and later), which now includes an additional server set-up utility application. In testing collaboration features, I initially ran into set-up problems. These were eventually fixed when I disabled the macOS firewall on the host machine, which was blocking access from the other connected Macs to its shared database. This took some back and forth with Blackmagic Design’s helpful support engineers until we figured out why I was getting the connection errors. Since I had to return the additional “dongle” (USB license key) before this was fixed, I wasn’t able to test two editors simultaneously editing within the same open project. However, the ability to open any shared project from any qualified computer on the network was just fine. I also tested the smaller, bus-powered DaVinci Resolve Micro panel. The Micro panel is just the right size for an editor or a DIT on set. It’s smaller than the Mini (tested previously in another review), because it doesn’t have the upward slanting portion in the back; therefore, it’s a better physical fit between your computer keyboard and display. You don’t have to shuffle desk real estate between tools, as you do with the Micro panel. In spite of not having the extra controls and LCD displays of the Mini, the Micro panel combines most of the control functions you need for fast grading. If you are an editor who is heavy into color correction, then this is a must-have for Resolve. I took an instant liking to the Micro. You can use both hands to quickly and intuitively work the trackballs and knob controls, making for faster and better correction. It’s tactile, with next and previous clip buttons to quickly advance through the timeline, so you can keep your eyes on the screen. I grade in Resolve, Avid, Premiere Pro, and Final Cut Pro X, and all of that is with a mouse. Using the panel easily resulted in faster grading by a factor at least 3X or 4X. I also achieved better-looking corrections with fewer steps or processes than grading in any of these other applications. Overall, there’s a lot to love about Resolve, in spite of a few rough edges. In general, it seems more stable under macOS Sierra than with High Sierra. If you use Resolve on a Mac, then you are stuck dealing with Apple’s platform changes. For example, recent Macs that use an Nvidia GPU are at a disadvantage under High Sierra, because Nvidia is just now developing drivers for CUDA under this OS. I experienced a number of crashes running Resolve 14 on my 2014 MacBook Pro until I manually changed the Resolve hardware configuration under Resolve’s preferences from CUDA to using Metal. When I installed what was supposed to be the newest CUDA driver, I still received a prompt that no CUDA-compliant card was present. But, it’s working fine using Metal. Macs with AMD GPUs should be fine. 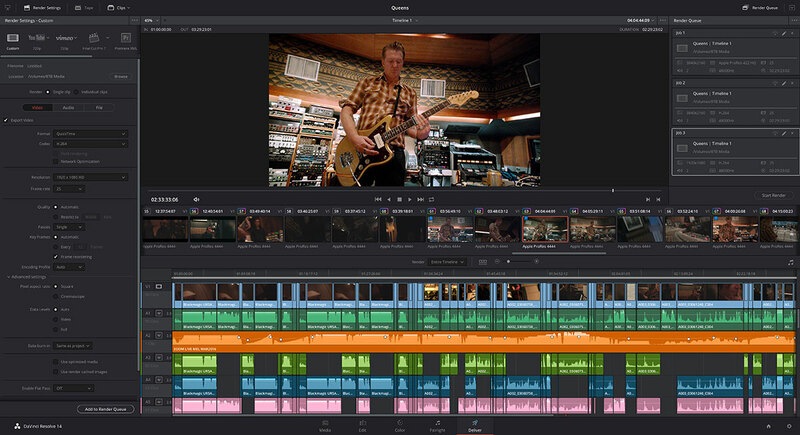 Resolve 14 is a dense tool, with a lot of depth in various menus, which some may find daunting. This review would be a lot longer if I went even deeper into the many specific features of this application. Yet, it is easy for new users to hit the ground running and then learn as they go. For many, this is their mythical “Final Cut Pro 8”. 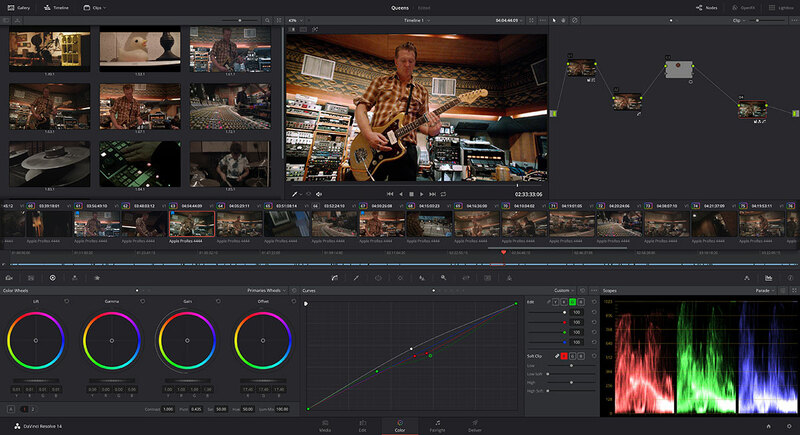 In any case, DaVinci Resolve 14 is the best incarnation of the all-in-one concept to date. If you add Blackmagic Design’s Fusion visual effects software into the mix (also available in free and paid versions), the result is a combination that’s tough to beat at any price. Blackmagic Design’s engineers have shown impressive development over a very short period of time, so I fully expect Blackmagic to give the three “A” companies a run for their money. 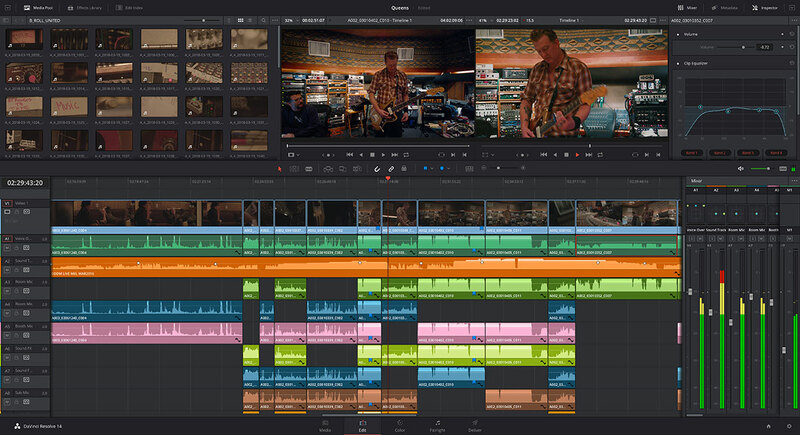 Even if you use another tool as your main editing application, Resolve is a great addition to the toolbox. Using it becomes addictive. Give it a try and you might just find it becomes your first choice. Primary sliders. 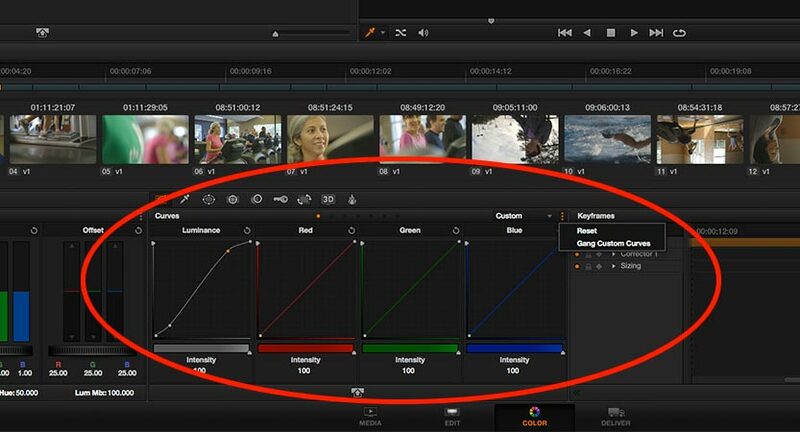 Resolve gives you two ways to adjust primary color correction – color wheels and sliders. Most people gravitate to the wheels control panel, but the sliders panel is often faster and more precise. Adjustments made in either control will show up in the other. If you adjust color balance using the sliders, while monitoring the RGB parade display and/or the histogram on the video scopes, then it’s very easy to dial in perfect black and white balance for a shot. If the blue shadow portion looks too high on the RGB parade display, it means that the shadows of the image will look bluish. Simply move the blue lift slider lower to push the shadows closer to a true black. An added benefit of this panel is that the controls react to a wheeled mouse. This is great if you don’t have access to a control surface. Hover the mouse over the slider that you want to adjust and twirl the mouse wheel up or down to make your correction. Gang/ungang curves. Given the propensity of cameras to record with log gamma profiles, you often find the need to apply an s-shaped luma curve during color correction. This shifts the low and high ranges of the image to expand the signal back to full levels, while retaining a “filmic” quality to that image. In the custom curves panel you’ll encounter a typical layout of four curves for luma and RGB. The default is for these to be ganged together. Adjust one and they all change. However, this means you are jacking around chroma levels when you might simply want to alter luma. Therefore, make sure to disable ganging before you start. Then adjust the luma curve. Only adjust the R, G or B curves if it’s beneficial to your look. Hue/sat curves. If you toggle the curves pulldown menu, you’ll notice a number of other options, like hue vs. hue, hue vs. sat, and so on. These curve options let you grab a specific color and adjust its hue, saturation or brightness, without changing the tone of the entire image. When you sample a color, you end up with three points along the curve – the pin for the selected color and a range boundary pin on either side of that color. These boundary points determine the envelope of your selection. In other words, how broad of a range of hues that you want to affect for the selected color. Think of it as a comparable function to an audio EQ. It is possible to select multiple points along the curve. Let’s say you want to lower the saturation of both bright yellows and bright blues within the frame. Choose the hue vs. sat curve and select points for both yellow and blue. Pulling these points down will lower the saturation of each of these colors using a single panel. The hue vs. hue curve is beneficial for skin tones. A film that I’m currently grading features a Korean lead actress. Her skin tones normally skew towards yellow or green in many shots. The Caucasian and African American actors in the same shots appear with “normal” skin tones. By selecting the color that matches her flesh tones on the curve, I am able to shift the hues towards a value that is more in keeping with pleasing flesh tone colors. When used in combination with a mask, it’s possible to isolate this correction to just her part of the frame, so as not to affect the coloration of the other actors within the same shot. Tracking/stabilization. Most folks know that Resolve has one of the best and fastest trackers of any application. Add an oval mask to someone’s face, so that you can brighten up just that isolated area. However, as the person moves within the shot, you have to adjust the mask to follow their face. 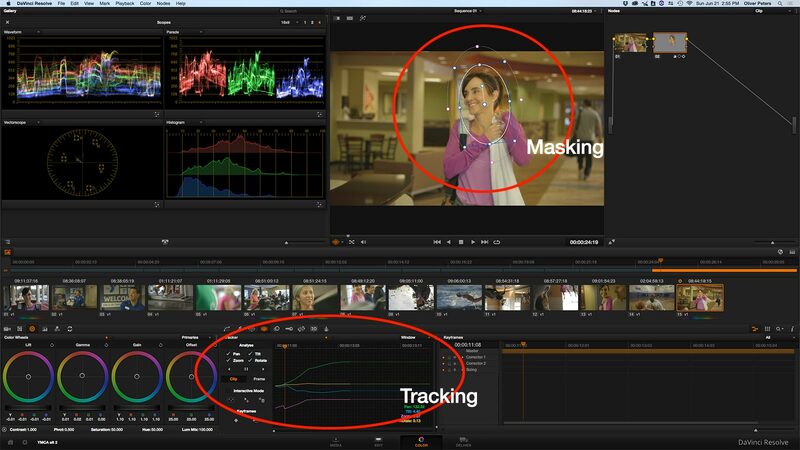 This is where Resolve’s cloud-point tracker is a lifesaver. It’s fast and most of the time stays locked to the subject. The tracking window also enables stabilization. Use the pulldown menu to toggle from tracking to stabilization. This is a two-step process – first analyze and then stabilize. You can dial in an amount of smoothness, if you want to retain some of the camera drift for a more natural appearance to the shot. Blurs/masks/tracking. 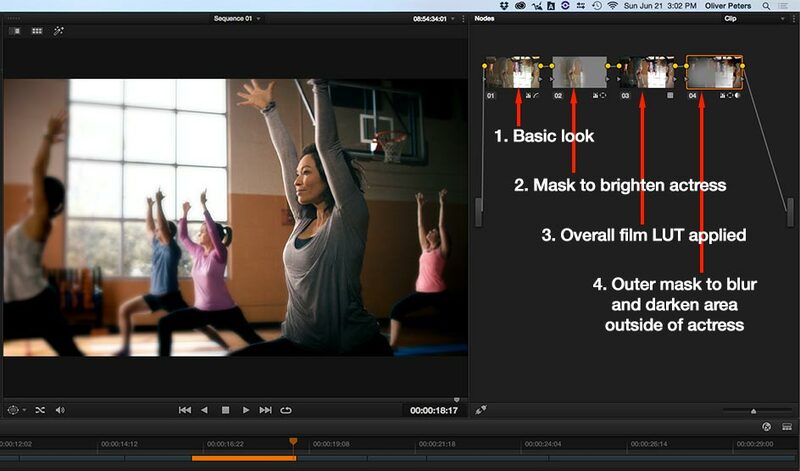 Resolve (including the free version) enables blurring of the image. This can be used in conjunction with a mask and with tracking, if you need to blur and track an object, like logos that need to be obscured in non-scripted TV shows. Using a blur with a vignette mask lets you create a dreamy effect. This is all possible without resorting to third-party filters or plug-ins. Scene detection/slicing. There are three ways to get a show into Resolve: a) edit from scratch in Resolve; b) roundtrip from another NLE using FCPXML, XML, AAF or an EDL; or 3) export a flattened media file of your timeline from another NLE and import that master file into Resolve. This process is similar to when masters were output to tape, which in turn were graded in a DaVinci “tape-to-tape” color correction session. 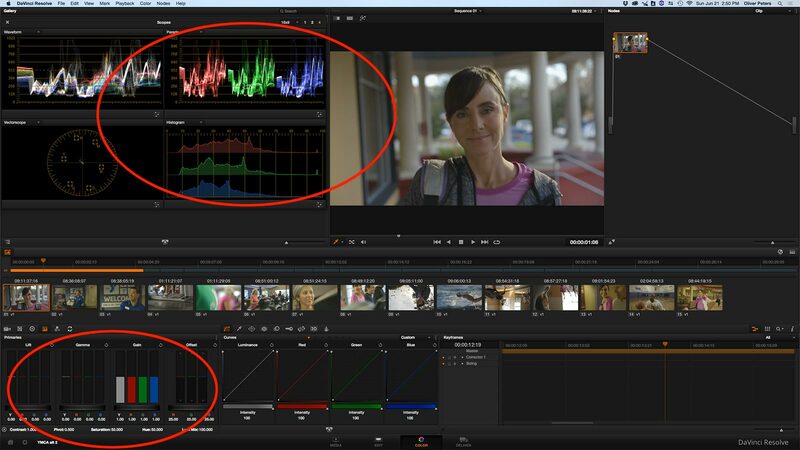 Resolve has the ability to analyze the file and determine edit points with reasonable accuracy. It will break up the files into individual master clips within your media pool. Unfortunately, these are viewed in the timeline as individual media clips with boundaries, thus making trimming difficult. My preference is to place the clip onto a new timeline and then manually add splices at all edit points and dissolves. 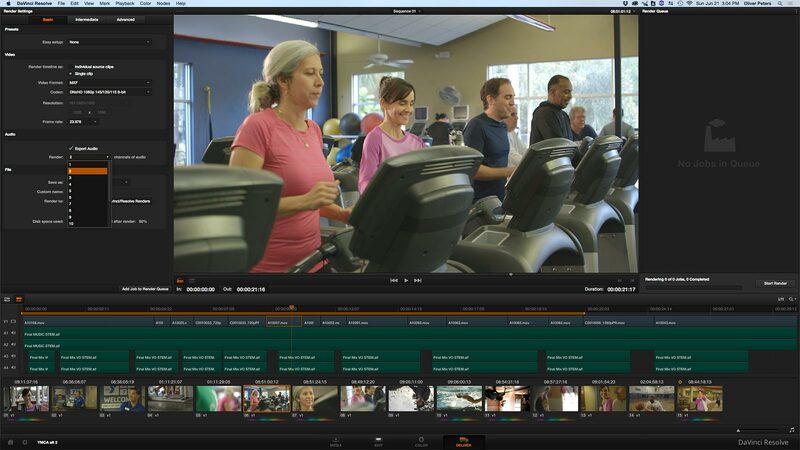 Since Resolve includes editing capabilities, you can trim, alter or add points in case of error or missed edits. This can be aided by importing a matching, blank XML or EDL and placing it onto a higher track, which then lets you quickly identify all edit points that you’ll need to create. Add dissolves. In the example above, how do you handle video dissolves that exist in the master file? The solution (in the Resolve timeline) is to add an edit point at the midpoint of the dissolve that’s embedded within the media file. Next, add a new dissolve equal to the length of the existing dissolve in the video. This way, color correction for one shot will naturally dissolve to the color correction of the second shot. In effect, you aren’t dissolving video sources – only color correction values. This technique may also be used within a single shot if you have correction changes inside that shot. Although in the second case, adding correction keyframes in the Color page is normally a better solution. This might be the case if you are trying to counteract level changes within the shot, such as an in-camera iris change. Node strategy. Resolve allows you to store complex grades for shots – which will include as many nodes as required to build the look – at a single memory register. You can build up each adjustment in multiple nodes to create the look you desire, store it and then apply that grade to other shots in a single step. This is very useful; however, I tend to work a bit differently when going through a scene in a dramatic project. I generally go through the scene in multiple “passes”. For instance, I’ll quickly go through each shot with a single node to properly balance the color and make the shots reasonably consistent with each other. Next, I’ll go back through and add a second node (no adjustment yet) for each shot. Once that’s done, I’ll go back to the head of the scene and in that second node make the correction to establish a look. I can now use a standard copy command (cmd-C on the Mac) to store those values for that single node. When I go to the next shot, the second node is already selected, so then I simply paste (cmd-V on the Mac) those values. Let’s say the scene is a two-person dialogue scene using two singles. Angle A is a slightly different color than Angle B. Set the second node adjustment for Angle A, copy, and then paste to each Angle A shot (leapfrogging the Angle B shots). Then repeat for the Angle B shots. Lastly, I might want to add a vignette. Go back through the scene and add a third, blank node for each shot. Create the vignette in node three of the first shot, then copy and paste into each of the others. I can still adjust the darkness, softness and position of the vignette at each shot, as needed. It’s a bit of an assembly line process, but I find it’s a quick way to go through a scene and build up adjustments without getting fixated on a single shot. At any point, I can review the whole scene and get a better feel for the result of my corrections in the context of the entire scene. LUTs. Resolve enables the application of technical and creative LUTs (color look-up tables). While I find their use limited and should be applied selectively, it’s possible to add your own to the palette. Any .cube LUT file – whether you found it, bought it, or created your own – can be added to Resolve’s library of LUTs. On the Mac, the Resolve LUT folder is found in Library/Application Support/Blackmagic Design/DaVinci Resolve/LUT. Export with audio. You can export a single finished timeline or individual clips using the Deliver page. At the time of this post, Resolve 12 has yet to be released, but hopefully the audio export issues I’ve encountered have been completely fixed. In my experience using Resolve 11 with RED camera files, it has not been possible to accurately export a complete timeline and have the audio stay in sync. I haven’t found this to be the case with other camera formats, though. So if you are exporting a single master file, expect the potential need to bring the picture into another application or NLE, in order to marry it with your final mix. Resolve 11 and earlier are not really geared for audio – something which Resolve 12 promises to fix. I’ll have a review of Resolve 12 at some point in the future.